The term ‘blended learning’ first appeared in the late-1990s when web-based learning solutions started to become more widely used and were integrated on one way or another with face-to-face methods. Of course the ‘blending’ concept has been around for much longer than the past few years. Apprenticeship training has ‘blended’ for centuries and the correspondence schools in Europe in the 1840s used blending. There are many other examples of ‘blending’ learning stretching back into the past, too. However, the incorporation of technology into learning or training delivery has given blended learning a boost. Speed reading machines in the late 1950s and 1960s (I remember my own speed reading courses – sitting in front of a large scrolling text machine in the early-1960s), interactive video (where some of the best eLearning programmes were developed in the 1980s), CD-based support and, of course, the Web have all contributed to our relative comfort in accepting blended learning as the norm. Each of these, though, were used to design and deliver structured and directed learning based on some form of instructional design and, often, as part of a curriculum. In terms of new delivery approaches, blending offers up new horizons. However, in terms of breaking the traditional ‘push’ learning model it offers up little. There are many definitions of blended learning. In 2003 the UK Department of Education and Training defined it as “learning which combines online and face-to-face approaches”. Most people would recognise that definition in what we see as blended programmes today - the use of two or more channels to make learning more easily or widely available. The diagram below also represents a common view of blended learning. It focuses on the ‘delivery channel’ - integrating technology with traditional face-to-face approaches and stretching the time available to spend learning. Diagram from Heinze & Proctor ‘Reflections on the Use of Blended Learning’(2004). Blended learning is a formal education program in which a student learns at least in part through delivery of content and instruction via digital and online media with some element of student control over time, place, path, or pace. The key point about blended learning as is generally understood is that it remains firmly based on a push model. The learning experience is designed by others and usually packaged into a coherent event or set of events by instructional experts and ‘delivered’. Of course within the ‘push capsule’ of blended learning there may be increased flexibility for individual learning preferences and increased flexibility of access. Participants are not constrained in the same way that they might be if they need to show up to a class at a set time and location to complete their learning process. More recently blended learning solutions have been expanded to include combining simulations with structured curses, using instructional technology to link courses with on-the-job tasks, and integrating workplace coaching with formal programmes amongst other approaches. In other words, ‘blending’ is starting to mean more than simply mixing delivery channels. It is still, however, focused on learning outcomes (rather than performance outcomes) and is still firmly based around the concepts of structured learning processes to achieve its objectives. This is what my colleague Jane Hart calls dependent learning (see diagram below). Blending is about increasing the efficiency and effectiveness of dependent learning. Although it may sometimes focus on extending learning into the ‘informal’ part of this diagram (and thus making it somewhat formal) the fact that the ‘blend’ is part of an overall designed programme, course or initiative makes ‘blended’ primarily fall into the formal/dependent category. As such, blended learning still essentially sits in the push paradigm. It consists of learning content (mainly) and possibly some learning experiences that are designed by L&D professionals for the use of others. This expansion of blended learning into the workplace can be termed ‘adding learning to work’. We intentionally add learning-focused activities into the workflow. A number of researchers and practitioners have categorised the process of extending learning into the workflow as ‘adding and embedding’ or ‘embedding and extracting’. The categorisation below brings together some of the ways in which this happens. Adding learning to work occurs where intentional learning-focused actions are taken to extend formal away-from-work courses and programmes back into the workplace. Most leadership and management programmes use this with work-based assignments, linked action learning, and other techniques. The key point is that ‘adding learning to work’ is achieved through intentionally designed activities that are linked with a formal learning intervention. Blended learning almost always falls into the ‘adding’ category. It is learning-focused and based around dependent learning models. 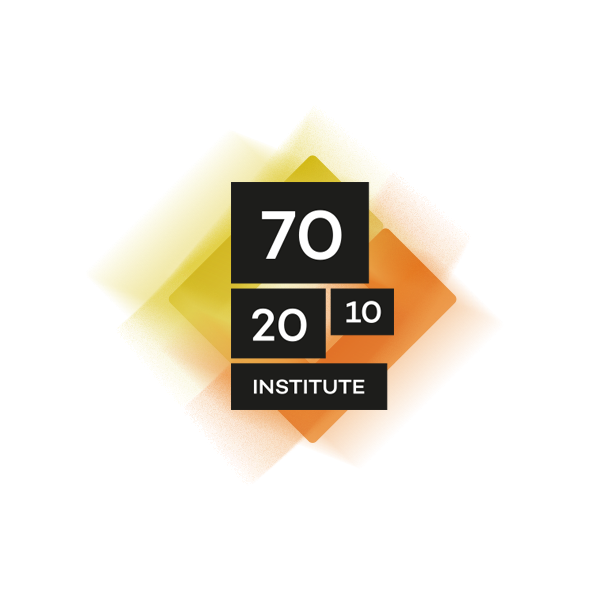 By contrast, the 70:20:10 model is based on the concept of utilising both push and pull learning to achieve greater impact, shorter time to performance, sustainability, increased innovation and cost constraint. A 70:20:10 approach spans all four of the categories above – adding, embedding, extracting and sharing. A 70:20:10 approach also encompasses Jane Hart’s interdependent and independent categories (above). It is important to realise the 70:20:10 strategic model emerged from a view of modern adult learning that is wider than ‘blending’. 70:20:10 draws on the fundamental changes that have occurred, and are continuing to occur, in the workplace. Work is becoming more complex. We work more in teams and rely on others to get our work done more than ever before. Experiential and social learning are becoming more critical day-by-day as agents of development. In response to this wider view of adult workplace learning, and to these changes, learning and work must, by necessity, merge. A re-focusing away from Taylorist views of management as a scientific discipline and the need to standardise for efficiency towards approaches to support the need for agility, innovation and speed. An acceptance that ‘best practice’ (i.e. one single best way to achieve optimum outcomes) is increasingly irrelevant in our complicated and complex working world. The focus is moving towards ‘good practice’ (i.e. practices that work well for our context but may not be appropriate in other contexts) and ‘emerging practices’ (i.e. practices that we develop retrospectively as we seek to improve). An understanding that a ‘curriculum’ mindset – where plans for standardised learning pathways are defined for standardised job roles and standardised career progression – is increasingly irrelevant in a world where a culture of continuous and flexible development is required to keep ahead. The knowledge that competencies (i.e. ‘satisfactory’) is what people should enter our organisations with, but that capabilities (i.e. ‘potential’) are what we need to help develop. The realisation that with the intangible value of organisations out-stripping the tangible value, people (the largest intangible element) need to be seen and treated as co-creators of value. What is in the heads of workers has never before been more important for organisations to survive and thrive. We still have a long way to go to break the learning=schooling mindset, to increase the impact and efficiency of learning, and to build cultures of continuous development embedded in work. But we’ve made some good starting steps. The 70:20:10 reference model can certainly help us expand our concepts and practices to support a better workforce development approach when it is used wisely and as an agent of change and not followed slavishly as some ‘rule’. Blended learning has been an important first step in this process as it has helped break the shackles of time and location imposed by the dominant face-to-face dependent learning approaches that have been in use for centuries. Technology has enabled that. The ‘richness-reach trade-off’ described by Evans and Wurster in 1999 has truly been broken. But ‘blending’ is just a baby step. Blended learning is still on the wrong side of the chasm between learning and the learning/work continuum – and it needs to jump. A lot more work is required beyond ‘blending’ to truly embed learning into work. It is important to remember that blended learning is a sub-set of 70:20:10, and one way to support a 70:20:10 approach, but it is not a replacement for it. If you’ve implemented blending, you’re on the road but not at the end of the journey yet. Charles, thanks for the post – you’ve really considered the issue. I do agree that learning and working go together and in the near future they may become inseparable. I really appreciated the detailed outline of the development of blended learning. Great post Charles, which had me nodding sagely in agreement! After 22yrs in corporate L&D I have left to set up my own consultancy business helping others to create physical environments that are conducive to learning: Learning Space Creations. Your post really resonated with me. Thank you. Great post Charles. We use blended learning, but nice to review for wholes and areas of improvement we might need to address. Thanks, we will share in our social networks.